You've just got to hold one of these to believe it. The North Face's ultralight Verto Jacket feels like a less-crinkly version of your average grocery store plastic bag—and I'm not talking about the heavy-duty variety. On my scale, a men's medium weighs 2.8 ounces, including a full zipper. And if that's not enough to astonish you, the Verto's 7D Pertex Quantum fabric is so sheer, you can actually see through it. 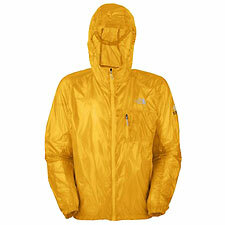 Yes, the Verto Jacket, released in black as well as a vibrant red and yellow, is translucent. Naturally, with gear this feather light, durability fears arise. I suppose I should talk about Pertex's impeccable pedigree when it comes to backcountry fabrics, but the truth is: I don't care. I don't care how waterproof this jacket is, how windproof it is, or how long it lasts. I don't care one bit, because I love it. I love it for how little it weighs. Ultralight shells under my ownership exist in one of basically two states: either in my closet, or in my backpack. I carry them as insurance against needs that very rarely arise—an unexpected thunderstorm. A stiff wind. Colder than planned temperatures. What I want from a shell in this category is for it to disappear utterly, occupying as little space in my pack as possible and contributing next to nothing to my load. That's the Verto Jacket, executed by The North Face to perfection. Squish it down effortlessly to less than the size of an apple. And if its weight bothers you, you can always leave a few M&M's behind. Is it fully waterproof? No, but it does shed water with almost magical ability, and it's sure to get you through anything short of a sustained downpour. Respect the jacket's limits, and it will serve you well. With regard to design, I have to say I am puzzled a bit as to why TNF made the Verto with a full zip. Give it a hoody-style half-zip, I say, and save an extra .2 or .3 ounces. Still, the full zipper is there if you need it, along with one zip chest pocket plus a hint of elastic around the hood, wrists, and waist. Simple, sheer, perfect. If you've got a fetish for ultralight shells, this one's a must-have. Put it on your list—and beware sticks, snags, and open flames.